Tucked away in a tiny satellite pharmacy on 3B are a few employees with really big hearts and tons of talent. These oncology pharmacists and a technician like to bring smiles to the faces of children living with cancer. The children and their families drop by the little pharmacy to pick up chemotherapy medication, anti-nausea medication and other drugs used to help them fight their cancer. The medication is placed in plain brown paper bags, similar to what you might use to carry your lunch. Until one day Ms. Jessika Truong, an oncology pharmacist, decided to customize the boring brown bags by drawing cartoons on them. She draws characters like Dora the Explorer, Bugs Bunny, and Nemo. “I started doing it just for fun. The patients were happy. It put a smile on the kids’ faces,” she says. “It is a way for me to open the door into the children’s world. I am forging a bond of trust. With children, you can form bonds through art and song. But the kids really don’t want to hear me sing!” says Ms. Truong with a laugh. Ms. Truong says her tiny gesture, drawing on those plain paper bags, makes the kids eager to come back to get their bag of ‘goodies’. When her fellow pharmacists and the pharmacy technicians saw how delighted the children were with the drawings, they too started to pick up colouring pencils to draw on the brown bags. It is now a team effort. It has become so popular with the kids, the pharmacy team now gets special requests from patients requesting particular drawings, such as a horse. Sometimes the pharmacy team adopts a theme such as an aquarium, where all the bags feature colourful fish and the kids can pick the one they want. About five to six bags are handed out per day. “The parents are happy and it shows that at The Montreal Children’s Hospital we put our heart in to everything we do,” says Ms. Truong. “Given how busy everyone in the oncology pharmacy is, I think this is an amazing gesture that is greatly appreciated by the kids and parents. They deserve recognition for going completely out of their way to make these kids’ struggles with their illnesses a little easier,” says Dr. David Mitchell, MCH Oncologist. One of the hard parts for the team was to figure out what to put on the bags of teenage boys. “I can’t draw a Ferrari, that is way beyond my talent level,” Ms. Truong says with a smile. So she decided to draw boats and fishing rods. One young man was delighted admitting that fishing is one of his favourite sports. “These simple drawings allow us to get to know our patients. It becomes more than the disease and the dose of medication they are taking,” says Ms. Truong. At times, the folks in the busy little pharmacy don’t have time to draw. Ms. Truong once tried taking a short cut, photocopying images on the bags. The kids knew right away and said she had ‘cheated’. “I don’t want to photocopy drawings on to the bags because it not the same, it’s not personalized,” says Ms. Truong. 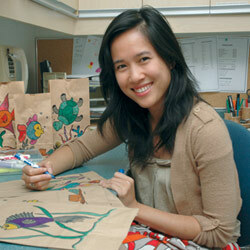 Right now Ms. Truong believes the MCH oncology pharmacy is the only one in Canada using cartoons to spruce up those plain brown medicine bags. In fact, one patient recently reported that while in Ontario at a summer camp for kids living with cancer, the other campers were jealous because his bags of medication sported brightly coloured drawings. “I hope we are starting a trend,” says Ms. Truong. She and colleagues hope other hospitals will follow their lead. She feels the team’s small effort makes a big difference for children fighting cancer.